This article was originally written by David Newton for ProMoviemaker Magazine. Visit David’s website here. An interesting little factoid that might come in useful for a pub quiz at some point is that the word photography is derived from the Greek ‘Photo’ and ‘Graphos,’ and literally means ‘light painting’. This is why when you’re shooting still images your overriding consideration is the light and how to capture it. Sadly, the etymology of the word ‘video’ is nowhere near as romantic or evocative as photography but that doesn’t mean that your consideration of light should be any less important. In fact, if you think of what video is – simply a long string of still frames – you’ll realise that lighting is just as important for video as it is for still photography. As ever, good lighting will enhance your footage, while poor lighting has the capacity to destroy it. With that in mind, it pays to spend time considering your lighting options for video; what will and won’t work and what you need your lights to do for you. For DSLR video work, there are two main lighting requirements that are not present in stills photography. Firstly, and most obviously, your lighting needs to be continuous. While it would be great to be able to use your Speedlite flashguns, with the exception of the Canon Speedlite 320EX which features an LED video light built-in, all flashguns are burst lighting – that is to say they fire a single flash that lasts a fraction of a second. Clearly this kind of performance is not that useful for video work. Next up, your light source should be colour temperature stable. If the colour temperature of your light source varies during use, you’ll see this colour change in your video footage. This could either be a colour change over time, or a flickering depending on the type of light being used. This is a situation you really want to avoid as it makes balancing the colour of clips in post-production much harder – and if you don’t correct for it in post, it will be very distracting to the viewer. As long as your lighting set-up fulfils these two requirements, then you have a suitable kit for shooting movies. However, one other thing you may wish to think about is size and portability. One of the great benefits of HD DSLR movie shooting is that the cameras are so small and lightweight when compared to ‘normal’ HD movie cameras. If this is an attraction to you, then you should also add ‘compact’ and ‘portable’ to your list of lighting requirements as well. Fortunately, there are now many lights that fulfil these needs. 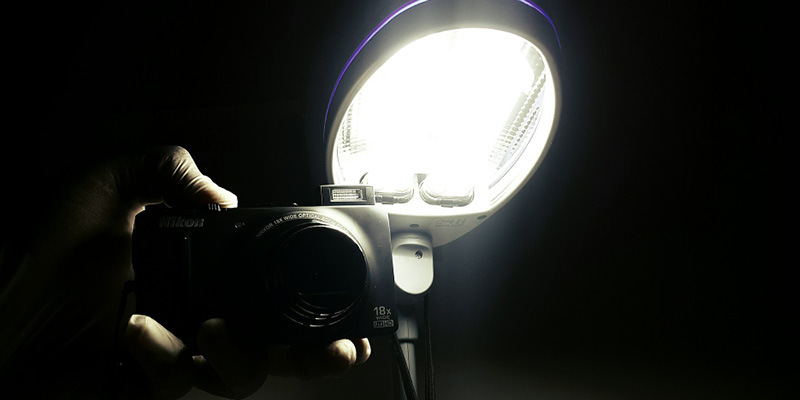 When looking at continuous light sources, there are four types you need to be aware of. Two of these you already have day-to-day experience of, while the other two will be known to you but are possibly less familiar. Tungsten lights are some of the most common lights you will see around. They are generally quite cheap and produce a reasonable amount of light. Unfortunately, they run very hot and are not that bright for the power required. However, they are a good first step. Be aware of their colour temperature though – they are very warm lights, generally running around 3200K so you will need to white-balance for them to ensure neutral results or use lighting gels to adjust their colour temperature. The downside of using gels is that it cuts light output, so you might find you need more lights to achieve the same brightness. You’ll often find tungsten lights in an enclosure with a Fresnel focusing screen to produce a range of light from broad flood to smooth spot. Lights such as the Arri Junior range and Lowel I or id lights are some of the most popular models available. Familiar to anyone who’s ever been into an office, kitchen or workshop, fluorescent tubes have spent the last few years gaining in popularity for a variety of household and business uses. Standard fluorescent bulbs, as you’ll no doubt have discovered, have a very green colour cast to them. However, bulbs for filming are made with a variety of different colour temperatures to avoid this green cast – 2900k, 3200k, 5500k etc. Unlike tungsten lights, most, though not all, fluorescent tubes are not dimmable. Instead the output is controlled either by adding a greater or fewer number of tubes, or by using ND gel to hold back the light output. Since the tubes are generally quite long, a combination of several tubes in one light makes what is, in effect, a very soft light source because the size of the light is quite large. This quality of light can be very useful. Fluorescent tubes are also much more efficient than tungsten lights, having a higher light output per watt of power. They also run much cooler than tungsten lights, making them ideal for use in places where excess heat could prove problematic. The downside, when compared to tungsten lights, is that they are much larger due to the size of the tubes. And as anyone who has handled a fluorescent tube knows, they can be fragile if knocked or dropped and so need to be handled with care. If you’re looking for fluorescent lights, then FloLight and Kinoflo are two of the market leaders, and both of these companies offer a range of sizes to suit a variety of needs. HMI, or Hydragyrum Medium-arc Iodide, lights were originally manufactured specifically for use in the film industry. They use mercury vapour in a glass bulb that is ‘excited’ by an electrical arc between two electrodes. These lights offer a very high light output – much greater than tungsten or fluorescent for the same wattage used. HMI lights do not run as hot as tungsten bulbs and the lamp life is generally longer, meaning that, although they cost more to begin with, the overall cost in time is reduced. When you switch an HMI light on, it is referred to as ‘striking’. In the first couple of minutes after switching on, HMI lights will be warming up before coming to a stable brightness and colour temperature. You need to remember this warming-up period first or you’ll find colour shifts in your shots. It’s also important to remember that many HMI lights cannot ‘re-strike’ until they have fully cooled down. This means if you turn an HMI light off, unless it has hot ‘re-strike’ capability, you will have to wait a while before turning it on again. Unlike tungsten lights, the design of HMI lights means they inherently flicker. Left unregulated, this would be visible in your footage. To avoid this, HMI lights use a ‘ballast’ to regulate the current flow and provide flicker-free lighting. The only issue with this is that the ‘ballast’ means HMI lights can be quite heavy. Aimed at the DSLR filmmaker, new HMI lights, like the Hedler DX15, aim to reduce this weight and so provide more compact HMI lighting to fit in with the lightweight DSLR filming ethos. The new kid on the block, LED lights are all set to not just take over the world of filming, but the world of lighting in general. Wherever you look these days LED lights are popping up, from car headlights to torches and bike lights to general house lighting. The filming industry, usually at the forefront of new technologies, is no exception. The benefits of light weight, exceptionally long lamp life and low power requirements mean LED lights are increasingly finding use on small and large budget productions alike. The most common type of LED lights seen currently are flat panel arrays such as those from FloLight and LitePanels. However, ever brighter and more powerful LEDs are also being used to create ‘traditional’ looking lights to rival tungsten and HMI lights. Take the LitePanels Sola 6 as an example – it draws 75 watts of power but outputs the equivalent amount of light to a 650watt tungsten light with a Fresnel lens. The advantages of LED lights are obvious – with such lower power requirements, they can be used on location without the need for heavy battery packs. In a studio environment, the low power requirements make them an ideal choice where running cost is an issue or where the ability to talk about green, or efficient, energy use is beneficial. LED lights are also cool when lit – they do not emit the heat of a tungsten, HMI or even fluorescent light. This makes them perfect for small spaces and also means your talent won’t start to wilt after five minutes under the lights. It also allows the lamp heads to be lighter since ultimately they don’t require the heat dissipating add-ons that are commonly found on HMI and tungsten lights. LED lights are also colour temperature stable and, in fact, many of the more high-end units feature the ability to adjust the colour temperature of the output without the use of filters. Even when dimmed, the colour output of LED lights is largely stable, so this means that you won’t need to re-white-balance every time you adjust the intensity. As is common with most ‘new’ technology, the prices for LED lights are a little higher. However, in the longer term, you’ll find that the lamp life and reduced power running costs will far outweigh the initial outlay. Talking about light sources is all well and good, but the real crux of light is whether it is hard or soft. The hardness, or otherwise, of light is determined by the size of the light source relative to the subject. The larger the light source, the more it wraps around the subject and the softer the light will be. You can tell if light is hard or soft by looking at the shadow – a sharp-edged shadow is hard light, a fluffy edged shadow is soft light. LED arrays and fluorescent tube lights are naturally large light sources so they are inherently soft light. HMI and tungsten lights are more directional in their lighting and it’s with these lights that you will probably need to use the familiar types of light modifiers like softboxes, barn doors, grids and reflector dishes to help control the direction, spread and intensity of the light you’re putting out. This should have given you an insight into the types of light you need to consider when looking at shooting HD movies. In the film world, renting equipment is more common than in the photo world, so before making a choice about what to go for, or indeed if you only need sporadic use of lighting, take a look at the film rental companies for the more expensive options. It will allow you to keep your budgets low or to try before you buy. This is a brilliant article! Thank you for posting.